In the hospitality and restaurant industry, we understand image is critical to the success of your business. Quality table linens enhance your image and give your restaurant the comfortable atmosphere your guest expect. Churchill Linen can help you make your restaurant a success by making your guests first impression a great one. Choose from a variety of colors and styles from table clothes, napkins, chef apparel, aprons and kitchen towels. Personalized custom logo entrance mats greet your guest with a warm welcome while promoting your business. Our anti-fatigue mats help your food preparation staff stay comfortable and safe from spills and falls. We will work with you to carefully evaluate your linen & uniform needs and develop a customized program tailored to your specific needs. At Churchill Linen Service we believe that when it comes to achieving the look and atmosphere that our customers aspire, a linen company should be able to meet those needs instead of limiting them. 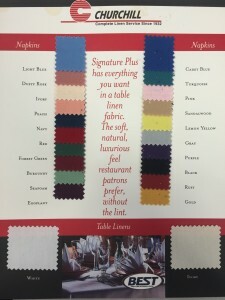 Which is why at Churchill Linen Service, our number one goal is to provide not only the best service in the area, but the largest array of tablecloth and napkin colors to ensure that each restaurant, country club, and banquet facility is able to attain the appearance they desire. White and Ivory are our core colors. However, below you will see some of our other popular 20″x20″ napkin colors.